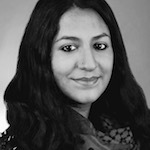 Dr. Maimuna (Maia) Majumder is a postdoctoral research fellow at Harvard University’s Health Policy Data Science lab and a recent graduate of the Engineering Systems program at MIT’s Institute for Data, Systems, and Society (IDSS). During her masters and doctoral studies at MIT, Maia was funded through a graduate fellowship at HealthMap computational epidemiology group. Prior to her arrival at MIT, she earned a Bachelors of Science in Engineering Science (with a concentration in Civil and Environmental Engineering) and a Masters of Public Health in Epidemiology and Biostatistics at Tufts University. While at Tufts, Maia was a field researcher with the International Centre for Diarrheal Disease Research, Bangladesh (ICDDR,B), where she worked with clinic patients (and their data) to learn how to better tell their stories. Her current research interests involve probabilistic modeling, data science, and “systems epidemiology” in the context of public health, with a focus on causal inference for infectious disease surveillance using digital disease data (e.g. search trends; news and social media). She also enjoys exploring novel techniques for data procurement, writing about data for the general public, and creating meaningful data visualizations. When taking a break from work, Maia moonlights as a jazz vocalist, budding chef, and primal wellness enthusiast who loves Bikram yoga and lifting heavy objects with her awesome husband.